at Hawaii Hall to keep the bird feathers intact. A "library of reality," a museum is where individual things are kept safely for the rest of society, and to that end, specialists in curation and restoration practice their arcane arts to keep these things just the way they were when they were accepted into the collection. There's an assumption that things donated to a museum will be kept as safe as possible. Tracking numbers, called "accession numbers" by curators, are assigned to each artifact now and forever. Where: Bishop Museum, 1525 Bernice St. Which is why it's good to see the new "Kahili Room" open at Bishop Museum. 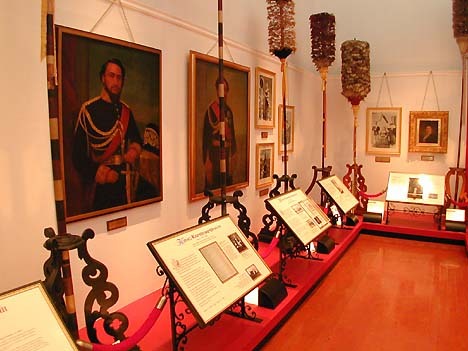 Not only is the room at the heart of the museum's original structure, the royal artifacts on display are among the most sacred, rare and fragile of ancient Hawaii. 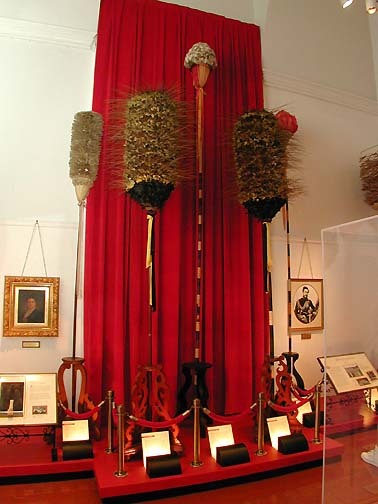 Right at the entrance is a kahili named 'Ele'eleualani, or Black Rain of Heaven, made of 'o'o feathers attached to an ash pole, passed down to Princess Bernice Pauahi Bishop and gifted to the museum in 1889 by her grieving widower, Charles Reed Bishop. The accession number on this artifact is Bishop Museum No. 1. That's right, numero uno, the very first thing collected by the museum, and several of the other kahili in the room are identified by single digits as well. Fragile kahili housed in Hawaii Hall. Not many -- if any -- other museums have their First Artifact front and center. The Kahili Room is exactly that, built about 1890 in the original Hawaii Hall structure, tall and protected to showcase the kahili. Over the years, the kahili were placed into storage, the room's windows were sealed off and climate control was added to house rotating exhibits. As a first step to renovating Hawaii Hall -- a crumbling, Victorian-era "museum of a museum" -- Bishop Museum created a coalition of community and Hawaiian consultants and museum professionals to figure out what to do with the Kahili Room. Their consensus: Put the kahili back into the Kahili Room. A secondary consideration was creating a context for the kahili, a kind of royal time-line running from the Kamehamehas to Lili'uokalani. The kahili are joined by information and images of their royal owners, in a setting that mimics the design ethic of Victorian exhibitry without the era's clutter and lack of focus. "This room, and the work that went into it, is purely the direct result of a collaboration between our staff and the community, and that simply isn't done in the 'ivory tower' of most museums," said Bishop Museum director W. Donald Duckworth. "What we were able to provide is dynamic professional design and construction skills to frame the message." 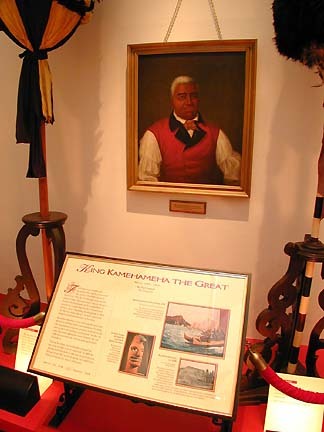 Kahili Room at Bishop Museum. The project was coordinated by collections manager Valerie Free and created by designer Dave Kemble. One not-so-hidden agenda was also to make a dent in the long-tabled restoration of Hawaii Hall, a landmark structure where flaking lead paint drifts down from the ceiling and dust on the papier-mache whale is more than a century old. 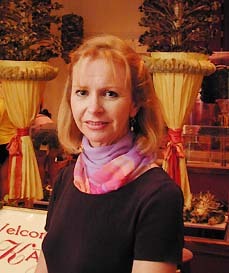 "It was very important to keep the historical fabric of the building intact," said Duckworth. "There is always a conflict between contemporary needs and the historical envelope a building resides in, and the trick is to strike a balance. "The biggest thing, obviously, was to reroof the building, and we did that some time ago. In fact, there is no time when we are NOT doing something for Hawaiian culture, and allegations that the museum is interested only in the physical sciences are unfounded in fact." The new exhibit -- which is semi-permanent -- was funded through the Native Hawaiian Culture and Arts Program, a partnership between the museum and the National Park Service. "A program Congress keeps trying to cut, by the way," said Duckworth. It took about nine months from kick-off to completion. The centerpieces of the room's collection are the kahili themselves, feather standards in a wide variety of colors and styles. The feathers became dull and discolored over time, they are unimaginably fragile. lightly vacuumed, but that's all. "You simply cannot keep such ephemeral material in a room that is not climate-controlled, and with low light levels," said Free. The feathers, many of which are from extinct species, "simply can't be touched," said Free. "Some of the newer kahili can be lightly vacuumed, but that's all. Rough handling will make them disintegrate." The Victorian-era silks and fabrics that form the kahili bases and ribbons are also cracking and fragile. The museum has 250 kahili in its collection, most of them disassembled. Only a few are on display in the Kahili Room. Most kahili were kept in families, said collections specialist Betty Kam, and passed on to the museum. The delicacy of the kahili mitigates against any being discovered in attics. It's possible that some kahili are deep in collections in European museums, but the core of the world's remaining kahili are being preserved at Bishop Museum. Kam points out that, like European paintings, individual kahili are named. The feathery standards were not just created for decoration, they are real and individualistic works of art and culture and carry a peculiarly Hawaiian resonance. Free is happy to see the kahili back in their showcase. "It's like a room of state, the museum's first gallery, and it's fitting that the arrangement is so formally arranged, like a kind of throne room." Paintings of Hawaii's monarchs have been gathered from odd places around the museum -- where they were placed for decorative purposes -- and help put a human face on the days of kahili. Some of the paintings have fading and darkening varnish, and will need some expert restoration work in the future. A painting of Bernice Pauahi Bishop that hung in Duckworth's office is still bright and clear. "The painting's fine," said Duckworth. "It was the frame that need some work. Turns out there was a beautiful gilding job on the frame -- that was hidden under a layer of gold radiator paint!"